Well, this sounded a lot better than it turned out to be. The art is manga-ish but this a Bande dessinée and the art favours the French style even with the touch of manga. So I enjoyed the art. The story starts out well. There's a skeleton character (always a favourite for me). But Mug and his intern Whiz start on a treasure hunt which looks promising until the mummy of the tomb challenges them to a game of 21 Basketball. 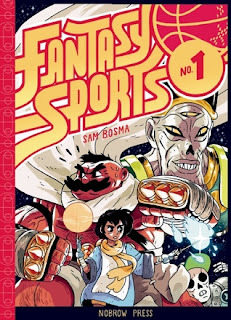 Then the rest of the book is simply a basketball game, back and forth sports action, which, to sports UNenthusiast me, found utterly boring. The last page is gross, though. I have volume two here so I'm going to read it and see if it gets any better.